The EL electro-pneumatic positioner combines the precision and adaptability of a digital electronic control circuit with the smoothness and efficiency of Kinetrol's proven proportional servo valve, to give the best available 4-20mA positioning performance from rotary pneumatic actuators. 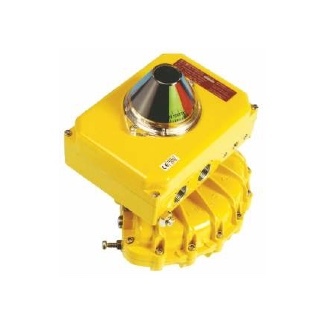 This unbeatable performance is combined with the easiest available setup procedure, easiest access to all functions and options, easy connectibility, and a truly compact all-metal enclosure, plus unique easy-set isolated angle retransmit and limit switch options inside the same enclosure. The EL positioner is designed to drive a rotary or linear actuator to a position set by the 4-20 mA input signal, and then hold it there until the signal changes. The microprocessor in the loop powered 4-20 mA positioner circuit reads signal via one channel of a 12-bit A-D convertor, reads the position voltage from tie pot via the second channel of the A-D convertor, and compares the two. If it detects a position different from that required by the signal, it changes its output to the servo valve in order to drive the actuator in the direction required to reach the correct position. As the actuator moves, the feedback pot voltage changes, and the microprocessor continually calculates how to adjust the servo valve in order to guide the actuator accurately into position. Because the servo valve is a fully proportional device, it can be adjusted precisely and smoothly to slow the actuator to a stop exactly where it should be. The microprocessor is programmed with a sophisticated but compact algorithm which allows this critical dynamic valve adjustment to be made correctly to give optimal results with any actuator/load combination - slow or fast, low friction or high friction, low inertia or high inertia, all can be optimized by PGAIN and DAMP parameters via the positioner circuit pushbuttons. The 12-bit A-D conversion gives resolution of about 1/40 degree. The relationship between the input signal and desired position (the "characteristic") is stored in the microprocessor's memory. It can be set to follow any one of eleven pre-programmed curves between its two endpoints. The endpoints (each a combination of a signal value and a position) are set by the user via the pushbuttons. 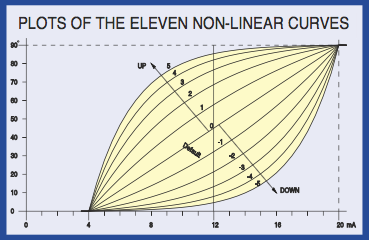 One of the eleven curves is a linearly proportional characteristic - this characteristic only can be selected to give movement of the actuator for signals extrapolated below the low endpoint and above the high endpoint, or to stop dead on signals below the low and above tie high endpoint. 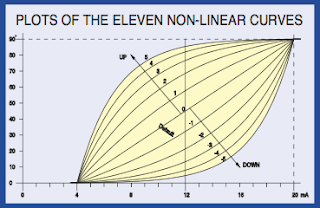 The "stop dead" behavior is the only option for the other ten non-linear curves. The settings entered by the user are stored in non - volatile memory, and are retained even if power (i.e. signal) is lost.